Honouring My Father And Remembering Nelson Mandela (1918-2013). Rest in Peace, Madiba! This is a note to the bereaved and the grievers, the mourners and the weepers, the criers and the wailers: Blessed are ye who mourn, for ye shall be comforted. December 5th is a poignant date that will always be etched in my heart and spirit for as long as I live. The reasons: 3 years ago today, I co-founded the Whole Woman Network, WWN, with a good friend of mine. WWN as an organization, represents and embodies my life-long desire and purpose to empower and transform lives. It was something beautiful to celebrate the launch and it seemed as if life had opened up her loving arms to my dreams! Fast forward to the present day, and a lot has definitely changed. I know now that sometimes in life, there are no reasons good enough to explain certain events and the seasons always oscillate through highs and lows. Life is neutral, it simply happens. We have the power to interpret and channel the events in our lives, (good or ‘bad’), into whatever path we choose. And we can tell either self-pitying tales or empowering stories about ourselves and others. I believe now that death should not only be mourned but it should also be celebrated. And because it confounds us, it offers us a chance for deep reflections and perhaps it also acts as a tour guide for the journey in life, leading us on a path of discovery and re-discovery. Over the past few years, after my father’s death, I too began an interesting and often daunting journey of re-discovering myself. I began to explore my past, present and possible future choices, to find and use my voice, and I chose to show up in my own life and live life fully, passionately and purposefully. Life seemed to unveil herself to me and each day offers a new mystery, a new teaching. Like an onion, a new layer of myself is stripped with every passing moment and the irony is that more I seek, the less I know. And overall, life has become this beautiful, vibrant, daring adventure! So far, the journey has taught me to discard existing rules established by ‘society’ and rewrite my own. Who makes the rules anyway? It has opened my heart to be more accepting and forgiving of myself and others. To own my faults and cut people some slack, knowing that we’re all still figuring it all out as we go along. It led me to embrace my own truth, to speak it and live it, unequivocally, always because life’s just too short to do otherwise. I began to grow in faith and in understanding that there are no accidents or coincidences in life and if you ‘looked’ long enough, you would be amazed at the patterns manifested in our lives. And these patterns interweaves and connects all us. I choose to believe that death is not an end, rather the beginning of a new vista, a symbolic awakening of the transient fullness of life. Death is but an even higher level of consciousness. I believe in the resurrection, in a new life after our tasks here is done. And so, I view death as a necessary path to living! I have also come to the realization that there is a sadder death that happens long before we really die. This death comes when we refuse to heed the calling of our hearts. This is the death that occurs the moment we forfeit our freedom to dream and deaden our will to pursue those dreams. This is the death of true courage required to live out our passions, and the burying of our gifts and talents , our cowardice in settling for a life of ‘survival’ rather than fight for our God-given right to thrive, and live a life of joy, service and value, on purpose, with purpose! This is the death that should be mourned and grieved with sorrow. And so I woke up today, reflecting on these life lessons learned from the death of my father. I had my funny, imaginary and healing conversations with him and even penned a few words to him which I posted on my Facebook page. Then, just as the day was drawing to a close, a news feed on Facebook caught my eye: Nelson Madiba Mandela had died at 95! And again, this took me on another reflective trip. Many years ago, during one of my post-graduate programmes, I had done a presentation on leadership and it had Mandela as the subject matter. I had to read up on him, his history, his life, his politics, his love and passions. I practically watched every movie and documentary about him. I started it as a mere academic assignment and ended up humbled and in awe. What I left with was a portrait of a man who dared to live courageously, with dignity and integrity. He was a transformational leader and shifted the moral compass of the world by simply standing up for his conviction and being himself. For example, even though his first marriage to Evelyn didn’t work out, he still sought love with the beautiful Winnie Mandela. And when his relationship with his feisty and charismatic second wife, Winnie Mandela, didn’t work out, they both handled the dissolution of their marriage with dignity, respect and love, thus honouring the years that they’d loved each other and worked together against apartheid. He was also brave enough to seek love again, a third time, and committed to another beautiful relationship with the lovely and intelligent Graca Machel, the widow of the former Mozambican president, Samora Machel. I learnt from my father and from Mandela that it is always possible…to dream, to walk the path that’s lonely and stand tall. That when we have the courage to lead ourselves, we automatically gift others the freedom to live their lives with truth and purpose. I remember both of them as epitomes of unconditional love. In heir unique ways, they fused heart and head in beautiful symmetry, a perfect blending of the intuitive power of an open loving heart and the strategic, willful and volitional use of a thinking head. Their every breath raised the awareness and consciousness of those around them. They showed me how to excel and raise the human bar of existence in challenging, often corrupt, difficult terrains, such as Africa. What a legacy! They both taught me the beauty and healing power of family. That family is not just limited to those related to you by blood. They espoused the universal truth that children remain our truest treasures and our main chance for transformation. And reiterated that you do not have to change the world, all you need do is simply focus on and change the person in front of you. And sometimes, you are the only person standing before you. In Africa, one of the greatest way to show love, respect and appreciation to the dead, is to honour their lives through our actions. I choose to honour my father in the choices I make daily, by living and manifesting all he espoused and shared with me. In the same vein, I have also decided to honour Mandela by watching and listening to all his speeches, documentaries and reading his own insightful words all over again. And subsequently, reflecting on what they mean to me today. His words are powerfully ingrained in the minds and heart of millions around the world. My prayer is this: May we too be blessed to seize the courage to live our own truths and convictions, may we honour the wise and uplifting words of Madiba and treat one another with love, respect, dignity and value, while celebrating the highs and lows of our common and shared humanity. I leave you with these last thoughts: When people die, they are not gone from us, death is simply a transformation of energy. There is a gift they leave for us, an important message that their lives and death send to us and if we pay enough attention, it will reveal itself. This message from the dead to the living is unique for everyone. You will get exactly what you need at the exact time you need it. The pain experienced at the death of a loved should not be wasted, rather it should be channeled to create something beautiful. There is indescribable beauty in ashes. Remember your deceased loved ones and great beings like Mandela, in their words, acts and legacies. So what are your key leanings from Mandela’s life and death? We are all connected, the ones before us and the ones after us….We are our ancestors’ only hope of getting it right, of doing things differently and significantly better. We are undeniable individuals and yet, we are also part of a beautiful WHOLE. We can do so much when we come together. Life in itself is a continuum, death does not break the chains, rather it strengthens it. Continue to Rest in Peace, dear Daddy. 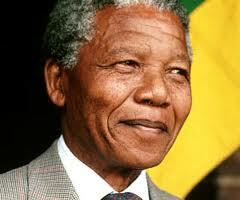 And Rest in Peace Nelson Madiba Mandela (1918 to 2013)! May God grant his family and friends the fortitude to bear his loss. The preceding is a guest post from Juliet Ume, MBA –Strategic Interventionist, Wealth Management Consultant & Leadership-Coach at Whole Woman Network. Juliet is the author of the upcoming book: ‘UN-Locking Your HeArt of Leadership.” She is an avid Life Connoisseur and a passionate advocate of WomEntrepreneurship, Leadership Training, Investment & Financial Literacy for women. Her mission is simply to engage, educate and empower women, regardless of their levels of income or background, to return to ‘wholeness’ and live Healthier, Sexier, Wealthier Lives using Faith-based, Scientific and Universal (Common-Sense) principles! Follow her on Twitter: @wholewomaninc, @julietumeinc. Read her daily reflective posts on her Facebook Page.